Alopecia areata is a common auto immune disease and condition of undetermined etiology characterized by circumscribed, smooth, usually asymmetric areas of baldness on the scalp , eyebrows and bearded portion of face . Alopecia Areata is a type of hair loss that occurs when your immune system mistakenely attacks hair follicles instead of harmful foreign invaders. The damage to follicle is usually not permanent. Alopecia areata is most common in people younger than 20, but childern and adults of any age may be affected. Women and men are affected equally. Alopecia areata is one of the most common forms of patchy hair loss. Patchy hair loss is often noticed by the hairdresser , usually during a haircut. Sometimes , the patch may go unnoticed until spotted at the parlour. Patchy hair loss is not life threating , but it can cause significant damage to one' s self image. However , the good news is that this condition often respond well to Ayurveda treatment , especially during the early stages. 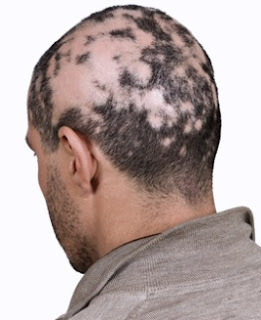 Alopecia areata usually begins when clumps of hair fall out , resulting in tottally smooth , round hairless patches on the scalp or other areas of the body. In some cases the hair may become thinner without noticeble patches of baldness or it may grow and break off , leaving shorts stubs. The hair loss often comes and goes hair will grow back over several months in one area but will fall out in another area. The meaning of above phrase is that when the vata dosha get vitiated along with pitta dosha it goes into the romakupam ie hair follicle and which results in hairfall. The next pathology that occurs is that the rakta dosha along with the kapha dosha goes in the romakupas which cause the romakupas to close which ultimately results in non growth of hair from the respective follicle. This disease known as indalupta , khalitya or rujya. Its yet not perfectly understood what causes alopecia areata. For some reason , follicle stop producing visible hair, resulting in smooth bald patches that can appear overnight. Researchers are trying to determine what triggers the disease, and whether it's from within the body or from enviromental factors. There are no diagnostic tests available which can predict the onset and behaviour of alopecia areata. However there may be some hereditary factors which play a roll in hairloss, in about 20 % of cases people with alopecia areata have a family member who are also affected . Below are few factors which are known as a trigger of alopecia araeta as per ayurveda and modern science view. The typical pattern is one or more bald patches appear on the scalp or may any other parts of the body. These tend to be around in shape , and about a size of a large coin. A family member , freind or hairdresser may be the first person to notice the bare patch or patches. Apart from the hairless patch , the scalp usually looks healthy. In few cases patient may feel redness, scaling , mild burning or a slighty itchy feeling on an affected area. Quite often the bald patch or patches re-grow hair within a few months. If hair grows back it may not have its primary color and looks grey or white. The original color eventually returns after several months. Sometimes , the intial hairless patch re-grow hair whilst a new bare patch is devloping. Often several small hairless patches develop and merge into a larger bald area. Patches on body hair, beard, eyebrows or eyelashes can be seen in some cases. Large bald patches develop in some people. Whole scalp hair loss known is alopecia totalis and complete body hair loss is known as alopecia universalis. The nails are affected in about 1 in five cases and can become pitted or ridged. When a bald patch first devlops , it is difficult to predict how it will progress. 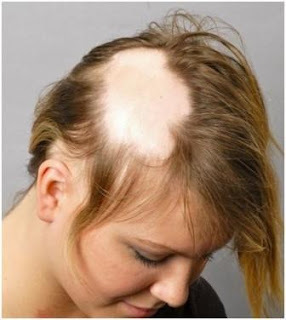 ALopecia areata behaves in different way in everyone. Ayurveda use three terms to describe the symptoms of hair loss which are Indraluptam, Khalityam and Ruhyam. Indraluptam can be corelated to alopecia areata ( ring shaped hair loss) . Khalityam is the general hair fall as a long continous process and Ruhyam is a hairloss condition which effects the entire body. However below are the classification of how it may progress . A small , round , non scarring smmoth patch which can be seen on any part of the body. Patient with repeated transient alopecia areata but never converts into alopecia totalis or universalis . The hair loss in this patients lasted longer than those with primary alopecia areata and sometimes associated with seasonal recuurence. Ophiasis type of alopecia areata shows a band like hair loss. It occurs mostly in the temporal or the regions of the scalp and is therefore more difficult to treat, as most medicines have a delayed action on these areas. Alopecia totalis and Alopecia universalis are known as an extreme stage of alopecia areata.Alopecia totalis means entire scalp hair loss and Alopecia Universalis means entire body hair loss. Alopecia areata treatment has been well discribed in classical ancient Ayurveda texts. While no treatment regime can promise a guaranteed cure, at Rudraksha Ayurveda we have got excellent results and suceesful stories without side effects with pure ayurveda herbs and ayurvedic oils & herbal paste treatment for external apllication. Rudraksha Ayurveda treatment is aimed at treating known causes, immuno restoration, treating the local scalp condition and reducing stress. Medicated oils and herbal paste are used for local treatment. Medicated oils prepared with the herbs such as Bhallatak, Bhringraj, Gunja, Amalaki, karanj and jaswand are give excellent results in alopecia areata . So we established use of such kind of excellent herbs made Alopecia cure Solutions ( include medicated oil and herbal paste ) which provide excellent relief from alopecia areata as a topical ayurveda treatment. we get excellent results in lots of patient of alopecia araeata use this kind of external therapy. Applications are so covenient that anyone can use it at home. Products are applied at night and washed off in morning. Shiroabhyanga The scalp of the affected person should be energetically massaged daily for 10 to 15 minutes with fingers, after claening with water. This mechanical action activates the hair follicles by ensuring blood circulation, and warms up the scalp. Sirolepa This is a special ayurvedic treatment for hair loss . The treatment involves application of a herbal pack on the scalp for 30 mins then washed .This process is repeated for 21 days. The herbal pack consists of just one herb or a mixure of herbs depending upon the constitution of the patient and the presenting complaints. Prachhaana This is done by pricking the skin of the scalp by needle like instruments and letting drops of blood coming out. This process is very scuceesfully in Alopecia areata. Dhara or pouring of medicinal liquids some water based herbal infusions are made from suitable herbs boiled in water, after the decotion is cooled down and strained , it is used to clean the scalp. Steaming Herbal steam on the scalp is useful in removal of blockage of subtle channels or srotas. leech Therapy Some ayurvedic physicians use leech therapy at the bald spots before using the above mentioned local medications and it is very effective to treat Alopecia Areata. The combinations of herbs for oral use is decided according to the dosha involved and the cause of the hair fall. As the hair disease are realted to the ' the asthi dhatu' or bone tissue so to treat hair loss the medicines which gives strength to the bone are given orally for longterm. The herbs are immunomodulators are also given to the patients of alopecia araeta for increasing immunity so immune system become strong and hair loss is stopped and start a new hair grow in the follicles . Pitta pacification is the primary ayurvedic hair loss treatment wia pitta pacification diet and pitta reducing ayurvedic medications . iron deficiency if exists also has to be corrected. Ayurvedic rasayans preparations for bossting iron level increasing the body immune function and to nourish body tisuues including bone tissue is a well regarded method in ayurvedic therapy beacause ayurveda believes hair and nail as the bi products of bone tissue formation. 1. Tab & Capsule hairgrow - which corrects the hair fall and increase hair growth on the scalp by hair growth promoters herbs like bhringraj, amalaki , yashad bhasma , yastimadhu and brahmi. Long term of use this ayurveda medicines hair becomes darker , shiny and very strong for long time and we see excellent hair growth in varoius types of hair problems espesially in all Alopecia and hairloss . 2. Tab asthidhatu- which nourish bone tissues of body and as a calcium supplement for hair growth promoter and very useful in various types of hair related problems in women. 3. Tab Stresmox - Which reduce stress and nourish the CNS system and give superb mental immunity and relaxation of mind. we use in this immunomodulators like Ashwagandha, brahmi, vacha and jatamanshi as medhya rasayans of ayurveda. 4. Tab Pittagna- which reduce excessive piita and acidic ph of body so this type of acivity enhance hair growth on the scalp and make hair darker and shiny and strong. In alopecia areata panchakarma treatment is very beneficial . Specifics areas of panchakarma suggested are Nasya, Ksheera basti ( medicated enema particularly for severe pitta imbalance) and Shirodhara ( Ayurvedic head massage ) for balancing hormone and stress level. 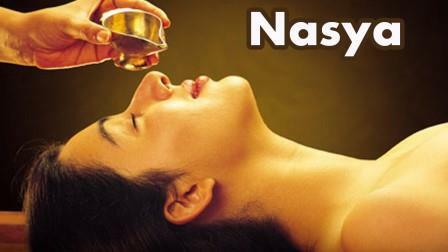 Nasya is a nasal therapy or administration of ayurvedic medicatition through the nasal cavity. Nasya helps in elimination of toxins through the nose. It is belived that regular application of medicated oils in the nose ( Pratimarsha nasya ) has an important role to play in preventing alopecia areata and premature graying of hair. Virechana is a medical purgation therapy and is helpful in reducing excess pitta dosha which is excellent in managment of alopecia. Ksheeravasthi is a type of basti therapy with milk. This is helpful in reducing pitta dosha. Basti is a soothing treatment for vata dosha and it also promotes bone tissue formation. Shirodhara Your practitioner gently pours a continuous stream of warm medicated oil over forehead for about 30 to 60 mins. In some other special situations, oil is replaced with medicated herbal liquids. Shirodhara is indicated for baldness, hair loss and greying of hairand alopecia areata . The practice of yoga not only makes you fit and fine , it also gives your body a beutiful look by protecting your hair and making it internally stronger. Yoga is beneficial for hair growth as it increase blood circulation to the head and scalp region. · Vajrasana is useful for the treatment of hair loss. · Strerss, tension and anxiety are common cause of hair loss, Relaxation techniques and meditation are quite effective to reduce stress. · Anuloma viloma refresh your entire body organ, especially the brain part and help in the strengthning of hair and hair follicles.